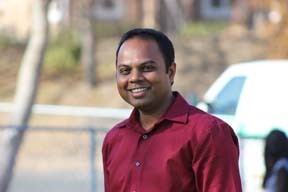 Bringing a multicultural blend from his native land, India, and an academic flavor from his doctoral work at the Graduate Theological Union, Berkeley, Chaitanya “Chai” Motupalli leads our program for Family Ministry and Young Adults. With changing family dynamics and demographics in our area, we are in the process of recasting our family ministry, and we want to address evolving needs of the diverse families. Our conviction is that relationships between parents and children, and also between parents, play a crucial role in the spiritual journey of the children. While it is important for the parents to provide an atmosphere for the children to explore their faith, it is also important for the parents as well as the entire families to be passionate to put their faith into action, and family ministry is aimed to equip the parents and families to reach those goals. For young adults, we want to present avenues to seek truth through various spiritual practices. In addition, with Jesus as our model of service, we want our young adults to be equipped to stand for whom Jesus served – the least, the lost, and the last. Young Adult Fellowship is the last Saturday of every month. Several youth camps take place in the summer and we encourage our youth to participate. Camperships are usually available to defray costs. The enriching experience of Church Family Retreat takes place the last weekend in September. All are welcome!